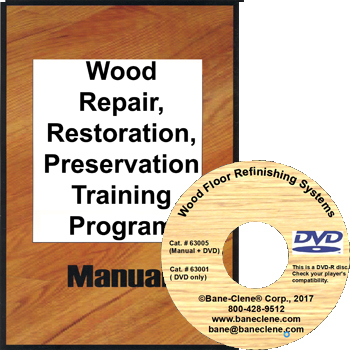 Hardwood Preservation Finish (Gloss or Satin) is a low solid blend of urethane and acrylic polymers designed to be used as a preservation finish over an existing urethane finish on a hardwood floor that has been properly cleaned and prepared. 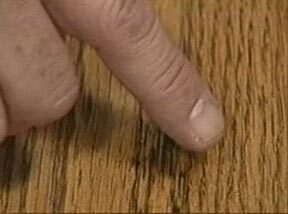 The Wood-Fresh Wood Floor Preservation finish serves as the wear coat and protects the original finish of the floor. The Wood-Fresh Wood Floor Preservation finish is extremely easy to use, applies easily and smoothly with excellent leveling. Most finishes from the factory and those applied to new raw wood will have a satin finish. The customer should be aware that the gloss finish will show slightly more imperfections such as scuffs and microscratches as it wears than the satin finish . It’s helpful to have some pieces of wood flooring you’ve prepared to show the customer the difference. 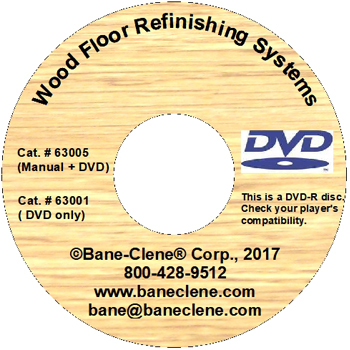 Bane-Clene carries two wood floor care system: Wood-Solv™ and the Wood Floor Preservation System. How do these two wood care and refinishing systems differ and where is each used? 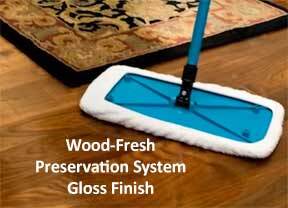 The key difference between the Wood-Fresh Wood Floor Preservation system and the Wood-Solv restoration system lies in the two words “preservation” and “restoration”. 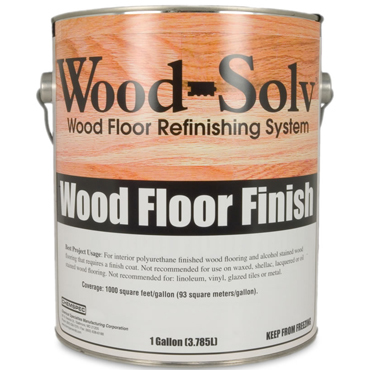 Because the Wood Floor Preservation system is so easy to use, we encourage professionals who’ve never worked with finishes before to start with this system before advancing to the Wood-Solv system. 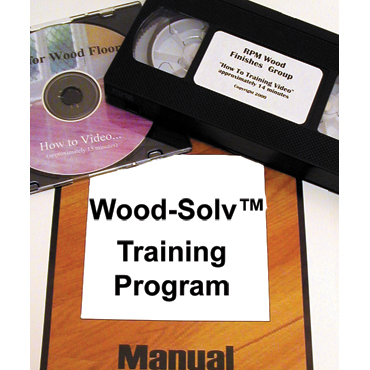 The Wood-Solv System is designed primarily to restore a hardwood floor or laminate floor that requires repairs, is badly worn with sometimes bare wood spots or is used on a floor with very heavy use such as in some commercial applications. 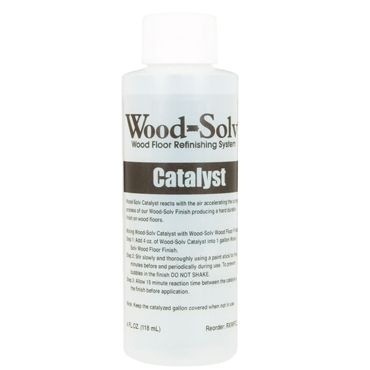 The Wood-Solv system incorporating a CATALYZED urethane very high solids finish is harder and more durable and can even be applied to bare wood and laminate. HOWEVER, it also is “trickier” to apply and get a smooth even coat with good adhesion. Additionally, once the finish is catalyzed in the can, it has a limited life span in the can. 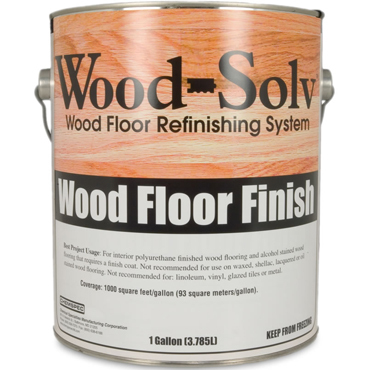 For refinishing and restoring laminate floors, floors with some exposed bare wood or severely damaged floors, Wood-Solv is the preferred system to use. Because the Wood Floor Preservation System is NOT designed for laminate floors or for hardwood floors with an aluminum oxide coating nor on bare wood, Wood-Solv is perfect for that application. Use pH: 8.0 to 8.5. Storage: Protect product from freezing - This finish IS NOT FREEZE-THAW STABLE! Keep container tightly closed in a dry, cool and well ventilated place when not in use. DO NOT pour left-over finish back into container! Coverage: 1,000 per square feet per coat. Stocking Feet Traffic: 1 hour after finish has dried. If applying the satin finish, 30 minutes prior to applying the finish, the container should be gently rocked to mix the ingredients. 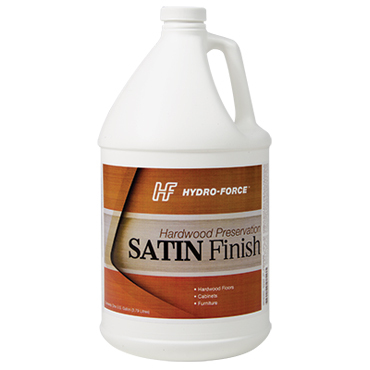 Apply finish with the Corner Edger Applicator or the Microfiber Wood Finish Applicator Mop. Corners and edges: Using the Corner Edger Applicator, apply Wood Finish to edges and corners by hand. 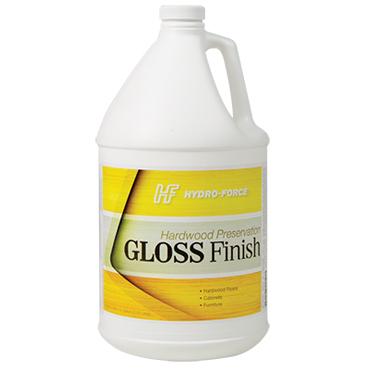 Apply the finish about an hour after the abrasion cleaning system is completed. 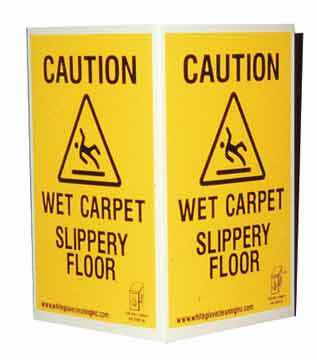 The abrasion cleaning system leaves the hardwood floor damp making necessary a dry time of about an hour. Avoid creating bubbles when applying the finish. Start in the furthest area from your exit. Apply a small amount of finish in a 4 or 5 foot area, spreading it uniformly as you work your way back toward the exit door. 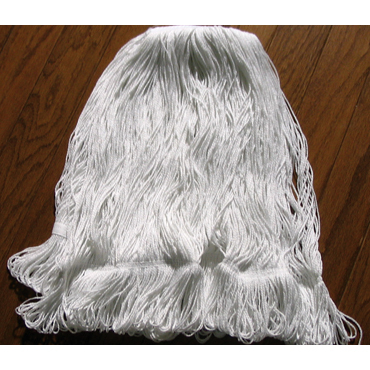 To apply, use the Corner Edger Applicator or the Microfiber Wood Finish Applicator Mop. Once the floor has dried naturally for approximately 45 minutes, a second coat of finish is then applied and also allowed to dry naturally. DO NOT force dry the finish. The end result is a clean, refinished and rejuvenated wood floor and a happy customer.